Joseph Matthew Panik (born October 30, 1990), nicknamed Joe Jesus, is an American professional baseball second baseman for the San Francisco Giants of Major League Baseball (MLB). He stands at 6 feet 1 inch (1.85 m) and weighs 190 pounds (86 kg). Panik bats left and throws right. Panik attended John Jay High School in Hopewell Junction, New York. He went to college at St. John's University, where he played college baseball for the St. John's Red Storm baseball team, playing in the Big East Conference. Panik compiled a .398 batting average with 19 doubles, 10 home runs and 57 runs batted in (RBI) during his junior season, ranking tenth among college baseball players with a .509 on-base percentage (OBP). Panik played the first game at Citi Field in a preseason game between St. John's University and Georgetown on March 29, 2009. Panik earned All-America honors from the American Baseball Coaches Association (ABCA), Baseball America and Louisville Slugger. Panik was also a finalist for the Brooks Wallace Award, an honor given to the nation's top shortstop. He was also a first team ABCA All-Northeast Region honoree, a first team All-Big East selection, and the Red Storm Most Valuable Player. Out of St. John's, the Giants drafted Panik in the first round (29th overall) of the 2011 Major League Baseball Draft. Panik made his professional debut with the Salem-Keizer Volcanoes of the Class A-Short Season Northwest League. He led the league with a .341 batting average, 49 runs scored, 54 RBI and a .401 on-base percentage (OBP) for Salem-Keizer, winning the league's Most Valuable Player award. He was rated the tenth best second base prospect prior to the 2012 season and was invited to spring training. 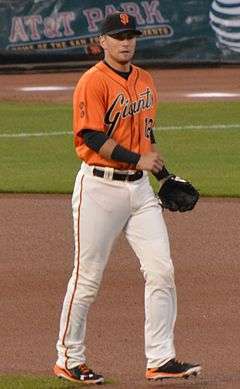 Panik spent the 2012 season with the San Jose Giants of the Class A-Advanced California League, batting .297 with 27 doubles, seven home runs, and 76 RBI in 130 games. 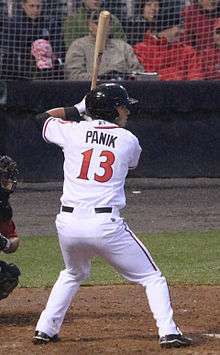 In 2013, Panik was promoted to the Richmond Flying Squirrels of the Class AA Eastern League, where he was moved to second base and recorded a .333 on-base percentage and 27 doubles, four triples, four homers. In 2014, Panik started the season with the Fresno Grizzlies of the Class AAA Pacific Coast League, where he hit .321, with five home runs, 45 RBIs, and 50 runs scored in 74 games. Panik made his MLB debut on June 21, 2014, pinch-hitting for the pitcher in the 8th inning and drawing a walk against Arizona Diamondbacks relief pitcher Matt Stites in a game the Giants won 6–4. Panik's first Major League start came the next day, June 22, 2014, when he batted seventh and played second base. In his second at-bat in that game he registered his first MLB hit. Panik hit his first home run on August 22, 2014 against Doug Fister of the Washington Nationals. It was a 3-run home run (one of Panik's 4 hits that night), which gave the Giants the lead in a game they eventually won 10–3. On October 16, 2014, in the 2014 National League Championship Series, Panik hit a two-run home run in Game 5 to help lead the Giants to an eventual 6–3 victory over the Cardinals to advance to the 2014 World Series against the Royals. On October 29, 2014, in Game 7 of the World Series, the Giants beat the Kansas City Royals 3–2 to win the series. In the bottom of the third inning with a runner on first, Panik made a diving stop on a ball up the middle and flipped the ball with his glove to shortstop Brandon Crawford to get the lead runner out. Crawford then threw to first to try to get a sliding Eric Hosmer out. Initially, Hosmer was called safe on the play but after a three-minute replay review, the call was overturned for the 4–6–3 double play. It was the first ever overturned call in the World Series since the replay review system was implemented, and the double play was regarded by multiple sportswriters as one of the most spectacular plays in World Series history. In the 2014 regular season, Panik played in 73 games and recorded 269 at bats. He scored 31 runs and 82 hits. He had 10 doubles and 2 triples along with one home run. Panik also recorded 18 runs batted. He was walked 16 times and struck out 33 times. He did not steal any bases. He finished with a .305 average and an on base percentage of .343. On April 5, Panik was named to the opening day 25-man roster. On April 22, 2015, Panik hit a walk-off sacrifice fly in the bottom of the ninth inning to defeat the Los Angeles Dodgers 3–2. Panik hit another walk-off nine days later on May 1, a pinch-hit, bases-loaded single against the Los Angeles Angels of Anaheim. On May 3, in a 5–0 win over the Los Angeles Angels of Anaheim, Panik batted second and homered off of Jered Weaver right after Nori Aoki homered to start the game. It was the first time the Giants started off a game with consecutive home runs since 1964. On July 6, Panik was selected as a reserve player for the 2015 All Star Game. On August 3, Panik was placed on the 15-day disabled list with lower back inflammation. He returned for three games in September before he was shut down for the season. For the 2015 season, Panik batted .312, with 8 home runs, 37 RBIs, and 59 runs scored. After the season, Panik revealed that the "back inflammation" was actually a stress fracture of the L5 vertebra and that it had fully healed by December. Panik and his fiancée, Brittany Pinto, have known each other since they were children. He has participated in a baseball clinic hosted by Matt Barnes at the Newtown, Connecticut Youth Academy for elementary school students in the aftermath of the Sandy Hook Elementary School shooting. ↑ "Joe Panik". baseball-reference.com. Retrieved 8 May 2015. ↑ "Francona & Hall Of Fame Guests Highlight Sixth Annual Baseball Bullpen Winter Banquet – ST. JOHN'S UNIVERSITY OFFICIAL ATHLETIC SITE". Redstormsports.com. January 31, 2012. Retrieved October 12, 2013. ↑ John Shea (June 6, 2011). "SF Giants draft St. John's shortstop Joe Panik". Sfgate.com. Retrieved October 12, 2013. 1 2 "Top Draft picks Gary Brown, Joe Panik among Giants' non-roster Spring Training invitees | SFGiants.com: News". Sanfrancisco.giants.mlb.com. May 24, 2013. Retrieved October 12, 2013. ↑ Mayo, Jonathan (January 20, 2012). "Prospect Watch: Top 10 second basemen | MLB.com: News". Mlb.mlb.com. Retrieved October 12, 2013. ↑ Ritzo, Joe (October 16, 2014). "A Look Back: When They Were San Jose Giants". MLB Advanced Media. Retrieved February 8, 2015. ↑ Pavlovic, Alex (September 4, 2014). "Giants' Joe Panik's quick rise from prospect to rising star". San Jose Mercury News. Retrieved February 8, 2015. ↑ "Giants call up top prospect Joe Panik". ESPN.com. Associated Press. June 22, 2014. Retrieved February 8, 2015. ↑ "Giants end season-high six-game skid in win over Diamondbacks". ESPN.com. Associated Press. June 21, 2014. Retrieved June 23, 2014. ↑ "Bumgarner dominates, Giants beat Diamondbacks 4–1". ESPN.com. Associated Press. June 22, 2014. Retrieved June 23, 2014. ↑ Haft, Chris (August 23, 2014). "Panik's huge night helps Giants halt Nats' surge". Retrieved February 8, 2015. ↑ Haft, Chris (October 17, 2014). "Giants among men: SF walks off to win NL pennant". Retrieved February 8, 2015. ↑ Silva, Drew (October 29, 2014). "Giants manager Bruce Bochy wins first replay challenge overturn in World Series history". NBCSports.com. ↑ Shea, John (December 27, 2014). "Joe Panik's Series-saving flip echoed Jeter's". San Francisco Chronicle. ↑ Gardner, Steve (October 30, 2014). "Giants' Joe Panik makes game-saving play of World Series". USA TODAY. ↑ Schoenfield, David (October 29, 2014). "Joe Panik with the play of the Series". ESPN.com. ↑ Neyer, Rob (October 31, 2014). "Anatomy of The Biggest Double Play". FOX Sports. ↑ "Joe Panik Stats". mlb.com. Retrieved 8 May 2015. ↑ "Giants set 2015 Opening Day roster" (Press release). SFGiants.com. April 5, 2015. ↑ Espinoza, Alex; Haft, Chris (April 22, 2015). "Panik caps eventful 9th with walk-off vs. Dodgers". MLB.com. ↑ Gonzalez, Alden; Haft, Chris (May 1, 2015). "Giants edge Angels on Panik's walk-off single". MLB.com. ↑ Gilmore, Eric (May 3, 2015). "Aoki, Panik power Giants to quick advantage". MLB.com. ↑ Brisbee, Grant (July 6, 2015). "Brandon Crawford, Joe Panik, and Madison Bumgarner make 2015 National League All-Star team". McCovey Chronicles. Retrieved July 7, 2015. ↑ Haft, Chris (August 3, 2015). "Panik goes on DL; Pagan to rest ailing knee". MLB.com. Retrieved August 6, 2015. ↑ Baggarly, Andrew (September 16, 2015). "Giants' Panik done for season". San Jose Mercury News. ↑ Martelli, A.J. (September 16, 2015). "Joe Panik placed on 60-day DL, season finished". Poughkeepsie Journal. ↑ Baggarly, Andrew (February 22, 2016). "Joe Panik's back injury last season was no mystery — and he'll get extra protection in the MLB rulebook this season". San Jose Mercury News. Retrieved February 26, 2016. ↑ "Bow Bridge connects Panik, fiancee after proposal". Retrieved February 26, 2015. ↑ Healey, Tim (December 1, 2014). "Barnes' baseball clinic benefits Newtown youth: Red Sox prospect started the event following Sandy Hook tragedy". MLB.com. Retrieved December 1, 2014. Wikimedia Commons has media related to Joe Panik.